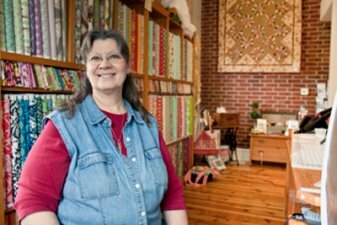 Our quilter, Ramona Sorensen is a nationally recognized quilter. She has been quilting for 8 years and has already been featured in several magazines including Quilt Magazine Sept/Oct 2012, Quilters’ Newsletter Dec. 2012, McCalls Quilting Spring 2012, and Fon’s & Porter January 2013. She has over 100 original free hand & medallion designs by Ramona and several more designs, medallions, and patterns to choose from. Pricing varies on the difficulty of quilting and spacing. Minimum charge is $30.00. We charge a penny and a half per square inch (basting your quilt) on up to 3 cents to 4 cents per square inch. For example a simple large stipple or star and loop would run you a penny and a half per square inch. A more difficult quilting design such as medallions in each block with several thread color changes would be 3 cents per square inch. Ramona would be happy to sit down and have a quilt consultation with you. We offer this service to help you finish off your quilt. We do french binding, scallops. Self binding is not offered. You may prepare the binding for us to sew on and hand stitch down for you for a smaller fee. Pricing of binding will vary depending on the finished look you desire. What is this? It is simply stitching that makes the holes for you to crochet in. We have a hemstitching machine which has a piercer that pierces holes into the fabric and two separate needles that sew the hole open. We offer this service for you to hemstitch on receiving blankets, burp clothes, bibs, pillowcases, edges of clothing, and carseat covers. Basic hemstitching is charges $1.12 per yard. For example a 36″ x 36″ blanket with 2 burp cloths will run $8.50. (Fabric not included in price). Print personalized images or photo’s onto 100% cotton colorfast fabric sheets. The sheets have been pre-treated to accept the ink. It’s ideal for sewing into memory quilts, keepsake projects and crafts. Order the opening size and color of your frame needed for your stitchery project, quilt block or cross-stitch. We have a wide selection of moldings to add to your frame. Besides ordering your custom frame we can also assemble the project into the frame for you. This assembly fee starts at $15.00. Price of frame vary in size and style. You may order the frame unpainted for a smaller fee.